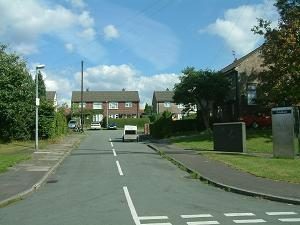 A street of solid 1960s semi-detached brick houses, many now in private ownership. Leads to East Avenue, Queen’s Close, Crossfield Road, Heath Road. 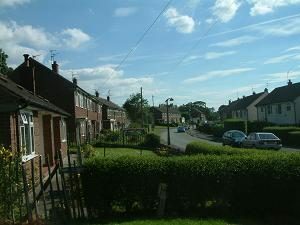 Nearest shops – In the street at the far end, and Bollington Road. At the very end is the entrance to the Bollington Athletic Football Club field where the Bollington junior teams play. Adjacent to the field is the Community Centre . Next to the Community Centre is a small row of shops including the General Store open seven days a week 6am to 9pm, and the Sweet Kitchen Café. There is a page describing the possibilities for the vacant land alongside Henshall Road opposite the end of Ovenhouse Lane, known as Hall Hill fields. Queen’s Close (left). Ovenhouse Lane takes its name from the farm beside the entrance to the street which is one of the oldest properties in the district.